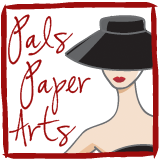 Well, I'd say there is some LOVE involved in this week's Pals Paper Arts Challenge! Tune in tomorrow to see how you can participate! Looks intriguing! I can't wait to see the entire card! Can't wait to see your full creation!